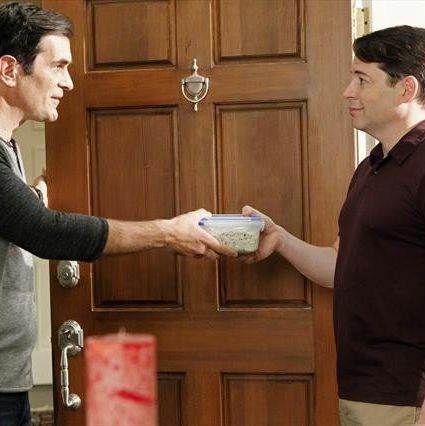 Modern Family has been all over the place during its fourth season’s first couple months. There have been complete duds, a few weeks that aced the push/pull between hilarious and heartfelt that got the show accolades in the first place, and a couple times — like last week — that threw us onto a high-speed (and often as high quality) joke treadmill for twenty-two minutes. “Mistery Date,” while funny, errs on the show’s loving side. There are enough laughs, but mostly it’s just a Really Good Episode. All members of the fam have been yanked from their usual routines. Phil kicks off his bachelor weekend by rigging the Dunphy ‘stead to his iPad, beatific at his ability to jet himself to the far future of 2025 AD, where we’ll swipe out of Angry Birds 23 to start up the hover-dishwasher. A more exciting carrot at the episode’s outset is the handling of Claire’s “go out and see some friends … promise me you’ll go outside and play” to Phil. Ordinarily this would provoke in me the one-two punch of, JESUS, Claire, leave the man alone! and the immediately subsequent Dah, fooled again. You’re fine, Claire. Further apologies about your character’s puppeteers constantly serving you this dreck. But none of that even pops up since Claire, and the whole of her sniping clan, gets dealt an unusual helping of humanity and kindness this week. Everyone’s grating, mean sides are dialed way down. At the inspiringly titled Academic Challenge, Alex and Claire (where the hell is de-colleged Haley, anyway?) face the dark depths of Claire’s helicopter parenting. Mama Dunphy is too busy peacocking via her daughter’s successes to remember she’s there to support said daughter. Alex loses early and gets the bonus of bearing Claire’s monologue about striving to live her own life rather than the lives of her children, nonchalantly slaying background Academic Challenge Qs throughout. “You know I’m in awe of you, right?” Claire sweetly tells Alex, just the right amount of time after going bonkers at Alex’s intellect with “Are you freaking kidding me, Macdeonia and Thrace, what even is that? !” But hey, it’s nice. She’s a proud mom. One of her kids has been asking her if he’s part owl and one of her kids is Haley, so. Giving the episode its punny title is an accidental romance between Matthew Broderick (appreciate the token name of “Dave,” ModFam, but we’ll stick with “Ferris Bueller”) and Phil. At the gym, Ferris, a gay buddy of Cameron’s (nice tie with Cam’s weight loss theme), has found a new racquetball opponent in Phil. Fastforward to a shy Ferris showing up at Phil’s house with spinach dip, although he’s unsure why. (“I’ll tell you why, ‘cause it’s delicious and you’re an awesome guest — get in here.”) Magical to see these two actors play out this storyline. (Type “is Ty” into Google and the search autofills “Burrell gay?!!? !” [punctuation mine]; type “is Matthew” and Broderick gets his sexuality scrutinized only after Matthew Perry.) And yes, it turns out Phil was unwittingly (so few things this man does wittingly) priming his iPad to make the house a firelit loveden. Props to the writers for handing Phil absolutely dead-on lines in one of those time honored sitcom LOL-fests where two characters are talking about two separate things, typically scenes that nosedive into stupidly hammy territory. “Don’t worry, we have the house to ourselves, they’re all out of town. I am long overdue for a boy’s night,” Phil tells a bewildered Ferris, who’s just learned his suitor is married with children. Even down to the “as long as I clean up after this, [Claire’s] fine,” the conversation is realistic and tailor-made for this awkward misunderstanding without resorting to eye-rolling double entendre. The exchange does start feeling a little contrived with the football-as-foreplay dialogue, and the shirt-wetting to shirt-offing is nothing but contrived, and the shirtless hug is … hang on, they’re heading to the bedroom? Time to just wave the white flag at this one. At least the episode’s restrained enough to spare us the big weird finish of Cam and Mitch walking into Phil’s house and dying with mortification or glee. Although, okay, I did kind of want to see that anyway. One last quick bit: If no one’s given Obama any assignments for his second term yet, could somebody could send over an email just really quickly asking for a steadier influx of Lily? Is weekly too much? Is she too young for that? Can’t I politely insist a 5-year-old’s childhood be shortchanged in the name of a sitcom? What if she gets a spinoff?